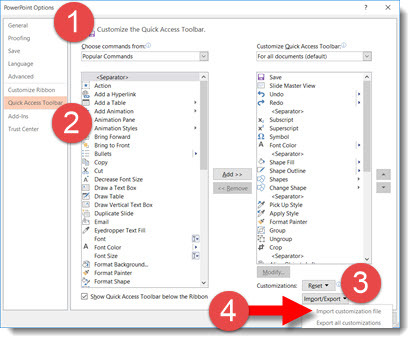 The Quick Access Toolbar (QAT) is one of the best options for making your design work faster, if setup properly. The PowerPoint QAT is basically a collection of the top used “buttons” always accessible without having to change tabs on the ribbon. Setting up the QAT is fairly easy, but tedious. But Microsoft has made it very easy to leverage someone else’s effort. In this case, my effort, think of it as my gift to everyone that reads this post, and instantly setup your QAT with 37 buttons to speed up design. Download the QAT file HERE (unzip and “PowerPoint Customizations.exportedUI”). In PowerPoint, go to FILE > OPTIONS > QUICK ACCESS TOOLBAR > IMPORT/EXPORT > IMPORT > select the downloaded file > say YES to the dialog > done. The Presentation Podcast Episode #20 Released Today! Oh, thank you so much for this.